I am currently part of the Active Staff and am a stockholder of the Mary Mediatrix Medical Center as a Consultant-Anatomic Pathologist in the Histopathology Division of the Pathology Department of the Hospital. My basic responsibility as Anatomic Pathologist is to gross examine surgical and other tissue specimens, make tissue sections and read these cases in the form of glass slides with tissue sections. In the process of doing so, we look at biopsies and diseased tissues and determine if there’s cancer or any other form of malignancy; or any other form of disease like tuberculous infections. In frozen sections, the surgeon sends to us fresh tissue samples (e.g. a breast lump) to determine if he has to remove the whole breast (Modified Radical Mastectomy) if it is malignant; or if taking out the lump is enough if the tumour is benign or non-malignant. We have to do this and give a diagnosis in a matter of thirty minutes or less because the patient remains “opened-up” in the O.R. until a diagnosis is made and the surgeon is guided on what to do next. In CT scan-guided fine needle aspiration biopsies (usually of the chest/lungs), our job in doing adequacy is to inform the radiologist or thoraco-cardiovascular surgeon who is doing the imaging-guided needle aspiration if what he has so far is enough to make a diagnosis, thereby ensuring also that we can reasonably make one with the material he or she has sent. 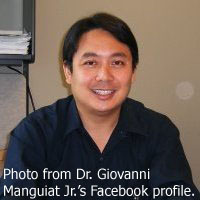 I started my career as a consultant specialist in Anatomic Pathology in 2003 as a junior pathologist at Victor R. Potenciano Memorial Medical Center, formerly Polymedic Hospital, in Mandaluyong where I was head of the Histopathology Section, Clinical Microscopy and In Charge of Quality Assurance. This entailed supportive work for the four senior pathologists who were the ones actually reading the cases and I would do the gross exams, the slide screening and all preliminary work needed before they would actually read the slides. So, to those who say “Why Patho?” – I always say “Why not Patho?” It’s an acquired taste that will need more of actually getting your feet wet and actually trying it out for yourself rather than waiting for someone to recommend it. My next stint was at Lung Center of the Philippines as Medical Specialist II and it was there that I learned the ropes, so to speak, in my other subspecialty of interest which was Pulmonary/Respiratory Pathology. I was taken under the wing of my UP College of Medicine Professor Dr. Nelia Tan Liu, who was US-trained in this particular specialty. It was during this stint that I was also head of Histopathology, Training Officer to the residents in Anatomic Pathology and Pathology Representative to the Lung Center’s tumour board. My advice to the young doctors: the field of Pathology is not for every aspiring specialist and you really have to live and breathe it and absolutely be passionate about it in order to truly find it to be your true calling. Professionally and personally, having to deal with highly unprofessional, devious, scheming, backbiting, artificial, envious and insecure people in the workplace – and there are always crab-like people like these anywhere you go – can really drive me up the wall and test my resolve to be non-confrontational and not to be belligerent. Future career plans involve my other great passions – Cytopathology and Medical Journalism. Perhaps, just like my role model Dr. Joey Avila, I can set up a Fine Needle Aspiration Clinic someday in Batangas so that all those problematic Cytopathology cases can have some reliable alternative venue to arrive at a reasonable diagnosis. The field of Pathology is teeming with a cornucopia of research material that is waiting to be tapped and written about. So, this forms part of my to-do list if given a chance in the near future. I started with the San Beda College of Medicine – the campus is at Mendiola University belt – as the one of the pioneering batch of faculty members when it started in 2003. I left temporarily after around four years then came back 2009. I am currently on sabbatical for this year. I am permanently assigned to lecture on my two subspecialties Neuropathology and Pulmonary Pathology; but for a few years, I was also teaching Genetics, Neoplasia and Paediatric Pathology. The demands on one’s time that teaching entails is certainly nothing to sneeze at – and I would ask for leaves during those years when I felt that my practice workload was becoming heavy, just to avoid spreading myself too thinly. But teaching really gives you a different kind of high, a fulfilment that comes from being a mentor to these young would-be doctors; and at the same time you try to keep up with the information super highway and, therefore, you yourself become updated on medical information that has changed so much compared to the time when you were still a medical student. Teaching full-time, though, would be too demanding on my time. The Acta Medica Philippina Journal, the National Health Science Journal, is a quarterly local publication of medical journals and special articles published by UP Manila, the Department of Science and Technology (DOST) and the Philippine Council for Health Research and Development (PCHRD). It is already online, has been indexed and, therefore, can be accessed outside the Philippines. I was personally invited by Editor-in-Chief Dr. Jose Ma. “Joey” Avila, former President of the Philippine Society of Pathologists, former chairman of Pathology at UPCM and a US-trained Paediatric Pathologist. He was also my mentor professor at UP College of Medicine and a very good friend. Prior to this, I had already worked in the Philippine Society of Pathologists as Chairman of the Publications Committee and Editor-in0Chief of Scope, our society’s newsletter. I was also in charge of the souvenir programs for both the annual and mid-year conventions. This was during the Presidency of Dr. Juliet Lorenzo, who has also become like my second mother, a very good friend and pathology mentor in the same way that Dr. Avila is. This job is such a joy because I get to proofread and copyedit and at the same time read the latest in Philippine medical research. By the wonders of e-mail, I am sent the material for editing; and in turn I send back my work most easily and conveniently. Migration and further training in the US was actually part of my initial post-medical board plans while I was still in Medical School. This is not surprising since I think 60% of my UPCM class are abroad, mostly in the US. At that time, Internal Medicine was the most feasible field that was open for residency positions. So, I got the ball rolling by taking and passing the first two required exams. However, personal circumstances made me rethink my career path. When my father got seriously afflicted with liver cirrhosis and chronic thrombocytopenic purpura, the complications of which eventually led to his untimely demise, it was certainly life throwing me a curveball that I was not expecting. The death of my father was clearly the most devastating event of my life; and while he would have loved to see me working abroad – he himself took his Masters at Georgetown University after his Political Science degree at the Ateneo – and he had always been behind me 100%. I just took it as a sign that someone up there had other plans. Of course, my UP mentors must have been rejoicing because they had always frowned upon too many UP Med grads going abroad and not coming back to serve the very taxpayers whose money was partly spent to subsidise the best medical education that we were so generously given. They must have been doubly pleased that I actually went back to my hometown, away from crowded Metro Manila to practice in a relatively “underserved” area. Then again, my immediate family and relatives are also grateful because there are always so many advantages to having a doctor in the family. My niece, who was born with malformed blood vessels in her brain, is actually one patient that I am happy to be “monitoring” ever since her condition was discovered eleven years ago. She is already thirteen now. Practice here in Lipa has actually been quite fruitful and fulfilling because not only is there less of the stressful traffic and less of the fast high pressure life; but I get to rediscover my roots and reconnect with people who have known me when I was a young determined student dreaming of a medical career. Old family friends and relatives have been more than happy to see me here.